Preferred Supplier 1.800.627.5665 | www.amerikooler.com Restaurants • Chains • Institutions • Hotels • Convenience Stores STATE-OF-THE-ART MANUFACTURING We make the most reliable and well constructed walk-in coolers and freezers for foodservice and retail markets. Our 200,000 sq. ft. facility is among the most advanced in the industry, using highly automated operations to rapidly and consistently produce the highest quality walk-in units on the market. Instead, any major changes in operators' present day purchasing habits directly reflect macro issues affecting the foodservice industry. That's not to say the economic influ- ences have faded away entirely. Rather, shifts in the usually stable foodservice industry appear to have a greater impact on purchasing behavior at the moment. For example, when it comes to purchasing foodservice equipment, operators report using fewer suppliers and attri- bute this to consolidation within the industry. When looking back at the past 18 months in the foodservice equipment industry, there seems to be a certain logic to this behavior. From February 2017 to March 2018, the foodservice indus- try saw 20 merger and acquisition transactions involving equipment and supplies dealers. For an industry not known for moving at a particularly brisk pace to begin with, this ac- celerated rate of consolidation is worth noting. Also, to satisfy consumers' seemingly insatiable appetite for all things local and seasonal, operators continue to change how they source ingredients. In fact, how operators purchase food and beverages represent some of the biggest changes in this year's study. 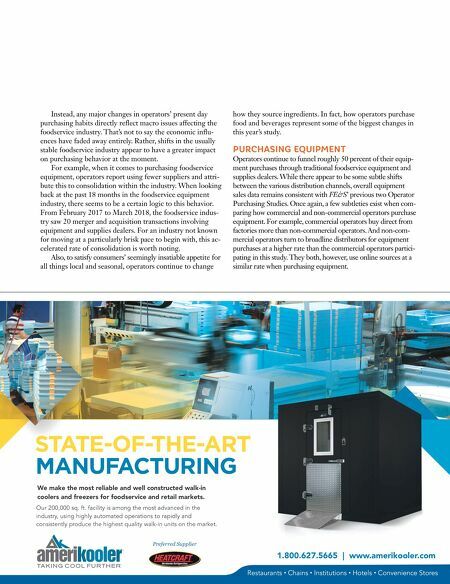 PURCHASING EQUIPMENT Operators continue to funnel roughly 50 percent of their equip- ment purchases through traditional foodservice equipment and supplies dealers. While there appear to be some subtle shifts between the various distribution channels, overall equipment sales data remains consistent with FE&S' previous two Operator Purchasing Studies. 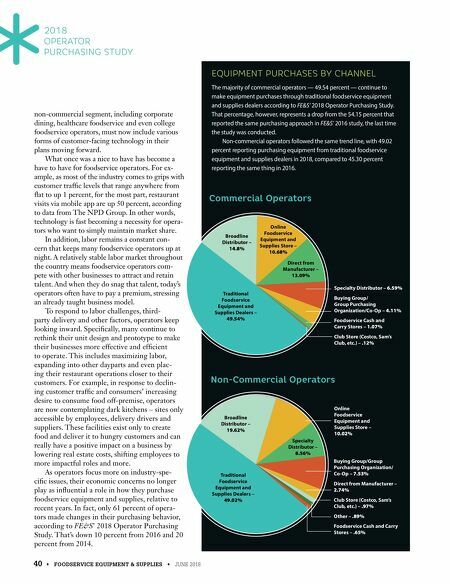 Once again, a few subtleties exist when com- paring how commercial and non-commercial operators purchase equipment. For example, commercial operators buy direct from factories more than non-commercial operators. And non-com- mercial operators turn to broadline distributors for equipment purchases at a higher rate than the commercial operators partici- pating in this study. They both, however, use online sources at a similar rate when purchasing equipment.